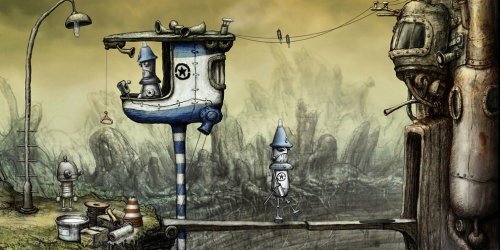 Although it was released a year ago, I’ve finally gotten around to writing about Machinarium. Coincidentally, it’s a part of this year’s Humble Indie Bundle. If you haven’t played it, now is a great time to pick it up at great price while supporting a good cause. I’ve never considered the adventure game genre to be very approachable or intuitive. Walking back and forth across a dozen screens, methodically traveling down long dialogue paths, and trying to divine the often-inscrutable uses odd inventory items is an acquired taste that not everyone enjoys. Personally, these game mechanics and dynamics usually have the effect of distancing me from the story. Machinarium is a brilliant counter-example to these complaints. It smooths out many of the genre’s rough edges and contains a story that has a lot to say about humanity, despite all the characters being robots. I also think Machinarium makes a good case for dropping the term “Flash” as a descriptor when talking about games built using that engine. The game’s story, art, and systems allow it to transcend the negative connotations that traditionally go with calling something a “Flash game.” It’s clear that a great deal of thought went into Machinarium. The result is a game with a singular style whose innovation and charm measure up to the most expensive triple-A titles. Whether it lives in your web browser’s cache or your Xbox’s disk drive, a great game is still a great game; there’s no need for a qualifier. That tangent aside, I’d be obliged if you took a look at what I wrote. In terms of stories about cute anthropomorphic robots, Machinarium gives WALL-E a run for its money. EXP Podcast #109: 2010 Game(s) of The Year!